Hinduism is a way of life. It is much more than a Religion and there is not even a Prophet. All that was revealed to many great ancient seers called Rishies during their deep meditation known as ‘Sruti’, form the foundation for Hinduism. It is believed that this knowledge is eternal and is professed and practiced by countless seekers of eternal truth. What is rightful is dharma and eternal is sanathana and hence the name Sanathana Dharma. 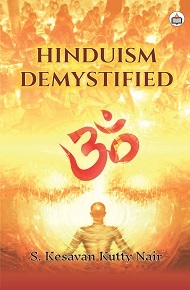 The author has made a humble attempt to bring out the great founding principles of Hinduism embedded in numerous scriptures, like Bhagavad Gita, Upanishads and Puranas through a conversation among family members in the first section spreading 12 Chapters. This section covers preliminary thoughts and principles and is meant for the beginners with no knowledge of Hinduism. The second section spanning 6 Chapters cover deeper Vedantic principles but the same style of conversation between a Guru (Teacher) and Sishyas (followers) is followed. It is hoped that the book would be useful to mothers for upbringing their children, youth in furthering their enquiry for God and the elderly to attain peace and calm. S. Kesavan Kutty Nair was born in Thiruvananthapuram, capital city of Kerala State,India in 1947.He is a graduate in Mechanical Engg and post graduate in Business Management. After serving Government and Private organisations in senior positions for three decades retired from commercial activities and took up intense learning of Hindu scriptures including major Upanishads and Bhagavat Gita with the help of reputed Acharyas especially Swami Adhyatmananda Saraswati. This is his second book on Hindu concepts and practices.